Super Bowl Sunday is a meaty day. There will be chicken wings, chicken drumettes, and chicken pot pie. Pork spare ribs, pork hot dogs, and pulled pork sandwiches. Beef burgers, beef chilis, and beef stews. I won't even mention all the bacon. Vegetarians will have to dig deep into their play books to even have a chance. Fortunately, they have a great offensive play: pizza. Cheesy, gooey pizza is immediately recognized as a Super Bowl food, but it can be designed entirely vegetarian. 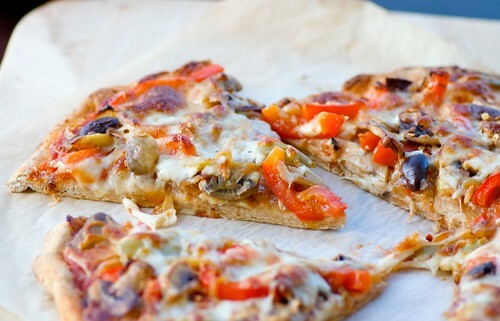 This Whole Wheat Veggie Pizza combines sauteed onions, mushrooms, and peppers with briny olives and earthy smoked Gouda. It's sure to look as good on the big day as it does on paper. Just make sure you have a strong defensive line to keep the carnivores away from it. For a quicker version, use a store-bought 1 pound ball of whole wheat pizza dough. 1. In a medium bowl, dissolve yeast, salt, and sugar in warm water and let rest for 5 minutes. Using a spoon, gently stir in 2 teaspoons olive oil. Add flour and blend with a spoon just until the dough starts to form; using using your hands, transfer dough to a lightly floured surface. Knead lightly for 1-2 minutes. The finished dough should be smooth yet heavy and dense. 2. Place the dough in a medium, clean bowl coated with olive oil and rub some olive oil on top of the dough. Cover tightly with plastic wrap and and let rise in a warm, draft-free area until doubled in size (about 1- 1 1/2 hours). Transfer dough to a lightly floured surface and roll out into a 12-inch disc. Transfer to a sheet of parchment paper (if using a pizza stone) or to a parchment lined baking sheet. Brush with remaining 1 teaspoon olive oil. If you like, you can let the rolled out dough rest for about 30 minutes; it will rise slightly and create a puffier crust. 3. In a large skillet over medium-high heat, add 2 teaspoons olive oil. Add onions and saute 3 minutes, or until just translucent. Add mushrooms and saute 3-5 minutes until lightly browned. Add red bell peppers and saute 2-3 minutes until lightly browned. Remove from heat. 4. Spread the tomato sauce evenly over the crust. Top with the grated smoked cheese. Arrange the vegetables on top. Scatter olives. Top with the mozzarella. 5. For a pizza stone, bake at 500 degree for about 10 minutes, or until both the top and bottom of the crust is brown and the cheese is melted. For a baking sheet, bake at 450 for about 20 minutes, or until both the top and bottom of the crust is brown and the cheese is melted. Serve hot or at room temperature, and garnish with fresh herbs. This is the kind of food that gives vegetarians a good name. Pass the pizza, please! If this pizza dough is anywhere near as amazing as your original recipe (although I do usually add 1/2 c of whole wheat flour to that one even), then count me in. YUM And gouda on a pizza? Amazing - why didn't I think of that! We don't need to be veggie to love this pizza Susan. Loving the wholewheat crust as well in every imaginary bite. What a luscious-looking pizza, Susan. This vegetarian would be happy to come to your table! By the looks of it - no one would ever know that something so delicious would be so healthy! TOO LATE! This carnivore is coming for it!! When I lived in Santa Fe, there used to be (and still is for all I know) this hippie-dippie pizza place with whole-wheat crust that I just adored. They added all kinds of quirky toppings; I think that may have been the first time I had pineapple on a pizza. OMG, it is still there: http://www.uppercrustpizza.com/ The toppings aren't as kooky as I remember, but I've probably eaten a lot more alternative pizza since then. It's been 20 years! kara-This is definitely a heavier dough than my original. But I love the texture and flavor. As for smoked Gouda, does it get better? val-I know. I served it to a couple of meat-lovers and they loved it! rosa-Mmm... I love squash pizza. sarah-Now that's what I like to hear! mark-Hah! You're welcome to it, my dear. I make pizza alot and have never made whole wheat dough! I must try this. It looks delicious. And by the way thanks for the complement on my pic. Wow! Your very sweet! We always make whole wheat pizza at home. I load on the veggies. Perfect pizza for Sunday! This looks good! I love veggie pizza - I much prefer it to meat versions! After all that cheese, adding sausage, pepperoni, ham, etc is just too much for me! A pizza cannot look better than this! So gooooood! Gouda sounds fantastic. Not watching the Super Bowl here in Austria - it comes on at about 2 am on a Sunday night, but I'm heading to a pot-luck Carnival party this evening and needed something to bring along. 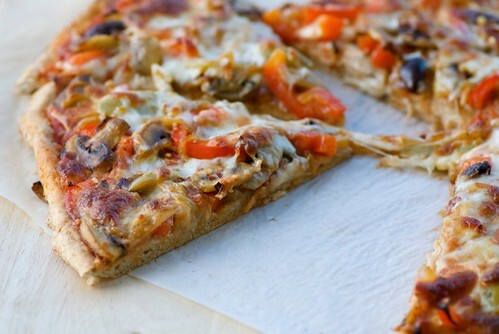 Whole wheat veggie pizza will do the trick! Plus that way I'll have at least one thing I can eat as a vegetarian.